Bathroom update with Rustoleum Cabinet Transformations! Our kitchen cabinets have been driving me a little crazy since we moved in over two years ago. They’re great cabinets and I love the layout of the kitchen, but there is just way too much oak happening in there for my liking. Here’s what we’re working with- this is before we moved in. Last April (2010), when Nathan was taking his last two weeks of paternity leave, we got really ambitious and planned on painting our cabinets white. Surprise, surprise! That didn’t happen. Painting all your kitchen cabinets is kind of a lofty goal when a 5 month old is involved and I was trying to do a bunch of school work. The kitchen was officially put to the back burner. WAY back. Fast forward to June. A series of events happened that made me decide it’s now or never to do the kitchen. That afternoon, we went off to Lowe’s and picked up a Rustoleum Cabinet Transformations kit. I had read quite a few good reviews of this product, so I figured I’d give it a whirl. I figured that a much safer whirl was our guest bathroom, rather than dismantling 20 cabinets and 8 drawers before knowing if this thing was actually going to work or not. The bathroom cabinets are also oak, the exact same as the kitchen. Sorry, no before photo. Use your imagination. I started around 5pm on a Saturday evening and was able to take the doors off, degloss, and put the two coats of the “bond coat,” which is basically just thick paint. The next morning, I did the gloss coat, let it dry and viola! I was done! All by myself- awesome! Many of the reviews I read online said it could take up to 4 coats to get my desired look- no wood grain showing. I was pleasantly surprised that I only needed to do two coats and I still love the look. 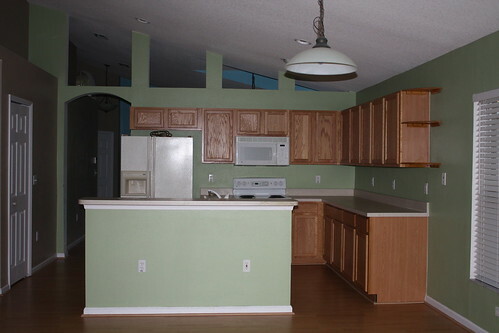 It might be a little different on the kitchen cabinets. I’ll have to find that out. Ready for the finished product? Cue angels singing! Woo hoo! Doesn’t it look great? We decided to go with gray- my ultimate favorite color. It’s actually “Winter Fog” according to Rustoleum. I could not be happier with the result and I can’t believe how easy it was! I decided to go with some brushed nickel Martha Stewart “goblet” knobs from Home Depot. I couldn’t figure out why they were called “goblet” knobs until I took them out of the package. Oh, Martha. You are clever. It’s a good thing!